While visits by former St. Johns River State College President Robert L. McLendon Jr. are a regular treat for administration, faculty and staff, Wednesday’s visit included a special guest with a surprise presentation. McLendon said the declaration was a total surprise and was deeply appreciated. “This is very special to me, and I will always cherish this recognition and honor. The Mayor is a great supporter of this College, and I am proud to have him as a friend,” McLendon said. McLendon retired from SJR State in 2008 after serving 36 years as its president. He was the most senior president in the Florida College System at the time. 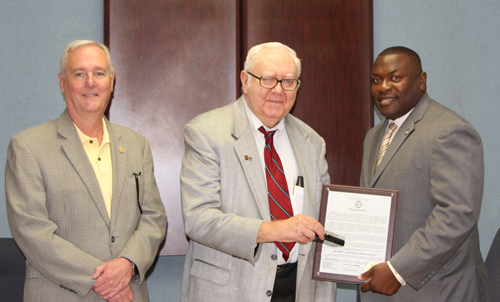 Mayor Terrill Hill presents former SJR State president Robert L. McLendon Jr. with a key to the city. From Left, SJR State President Joe Pickens, McLendon and Hill.